Phil Jackson’s reign of terror over the New York Knicks will not span more than 171 losses. The New York Knicks and team president Phil Jackson announced Wednesday morning that they mutually agreed to part ways. So it turns out Dolan’s breaking point was Kristaps Porzingis. Good to know. This is one of those times when we can support Dolan’s reasoning. Jackson has to go. That’s a fact. He’s overly concerned with the triangle offense’s spot in today’s NBA, and he’s now battling with the Knicks’ two best players. It takes a special kind of ignorance to do that with a straight face. Let’s make one thing clear: Dolan is no hero. He picked up the final two years and $24 million on Jackson’s option, which he’ll now have to eat. He’s also making this decision days before free agency begins, though that doesn’t matter too much since the Knicks cannot harm their curb appeal more than they already have. Regardless, this is an ax that need to be swung. 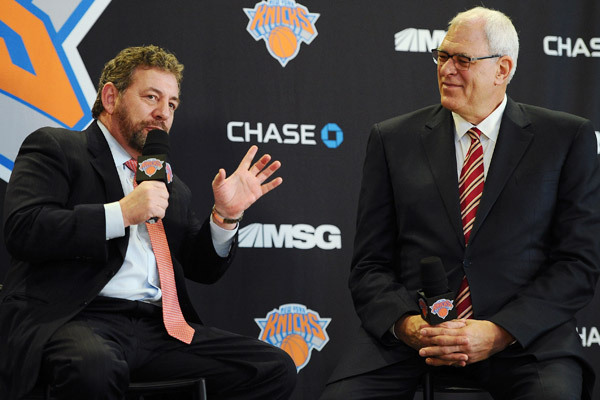 Will the Knicks be better off for it, knowing Dolan, long a self-saboteur, is still the end-all of decision-makers? Only time will tell.